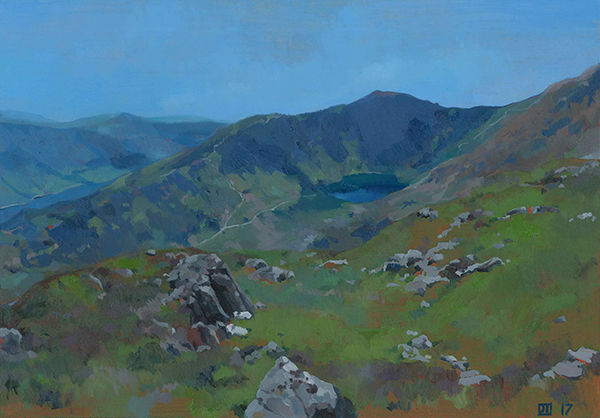 An oil painting on board of the spectacular tarn Llyn Cau ringed by the jagged ridge of Cader Idris in Snowdonia, Wales. I've climbed this mountain a number of times, making the long horse shoe shaped walk along the Minffordd Path which snakes vertiginously up the ridge of Craig Cau to the peak Penygadair (which wonderfully translates as top of the chair or stronghold) and then back down around the broad shoulders of Mynydd Moel. I think it has to be one of the most visually stunning vistas of the British Isles, that I've seen at any rate. It feels like a special place, beautiful and wild. I made the sketches for this painting on a stunning day in May without a single cloud in the sky and barley a breath of wind even at the summit, just shy of 900m. A bit of contrast to my previous visit when you could not see for more than 20 meters through the rain sodden cloud. I love this place.